The system, marketed by UK Haptics, is still at an early stage, but could be used for training nurses next year. "This is very much like force feedback in gaming, but it is much more refined," said Gary Todd of UK Haptics. "You can feel the needle go through the skin; you can put it in the skin and lift it out," he told BBC News Online. "You can feel the soft skin and muscles and you can scratch the bone if you put it in the knuckle." Conventional training techniques for perfecting the art of blood drawing and skin puncturing have been limited. 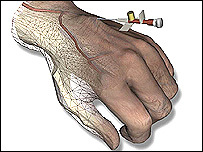 Plastic mannequins are used with replaceable pads which carry the complex vein structures. But they give little idea of the pressure needed to puncture the skin, and are not too realistic. Each arm costs about £300 and the pads cost £65 each, so there is not much flexibility to practise on different hand types, like elderly, infant, or damaged ones where veins have collapsed. The 3D model could be adapted for nurses to experience different types before they are let loose on real people. "The idea is we can have a fleet of hands. If we can produce a suite of hands, the student is going to feel more confident when they are sent out into the field," said Sue Todd, programmer and partner at UK Haptics. The company has licensed the technology from its developers, Swedish firm Reachin Technologies. It will tell users if too much pressure has been applied, and when the vein has been missed. The hardware is a high-end, off the shelf computer with twin 2.8GHz processors, explained Mr Todd. One refreshes the graphics at 30 times a second while the other refreshes at 1,000 times a second to generate the "feel". "We use just a normal flat screen monitor. You look into the mirror in front of the screen to allow for the 3D space." 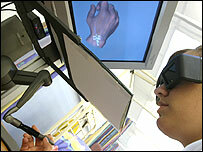 UK Haptics said the system could also be adapted for different models where practising might be difficult. It could prove highly valuable in cervical smear simulation. Currently nurses have to practise on at least 35 women until they are considered fully trained. UK Haptics said it planne to add more clinical elements and a feedback interface so that students and lecturers could gauge and record their performance over time. The system could eventually be extended for remote training, with a lecturer in one location and the trainee in another. Student nurses at the University of Northumberland have tried the system and said they would prefer it over the plastic dummy hand, said UK Haptics. "Our difficulty has been in getting across what it is," explained Ms Todd. "When you explain you have this virtual program you can feel and touch, they look like you have dropped down from Mars." There has been wide ranging research into haptics, much of it in academia. The problem, according to Mr Todd, is that there has been no real focus to its mass market development. Surgeons who do key-hole surgery have used 3D systems like this to train, but UK Haptics see their system as having a more widespread appeal to a large number of nurses. Dr Sile O'Modhrain, lead researcher of Media Labs Europe's Palpable Machines group, said there is a big future for haptics, but there are still barriers. "One of the reasons why haptics hasn't achieved mass market visibility is because the devices are still very expensive," she told BBC News Online. "Haptics has turned up in things like computer games. But there is a distinction between kinds of haptics, like force feedback where device pushes back against you, and cheaper vibration haptics which turn up in mobiles." For haptics to get cheaper, there must be recognisable added value and the field of medical simulation is an obvious start, she said. "There you see you have the ability to hide a cost which is smaller than usual. You would have many users using one system so it is easier to justify costs. The benefits are huge."